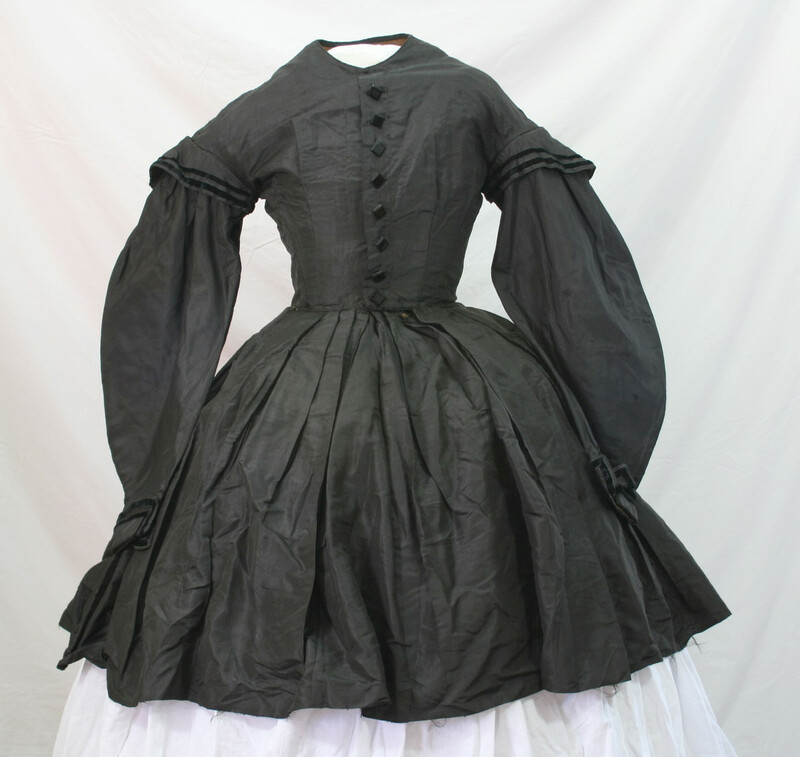 This is one of my favorite dresses. Ever. 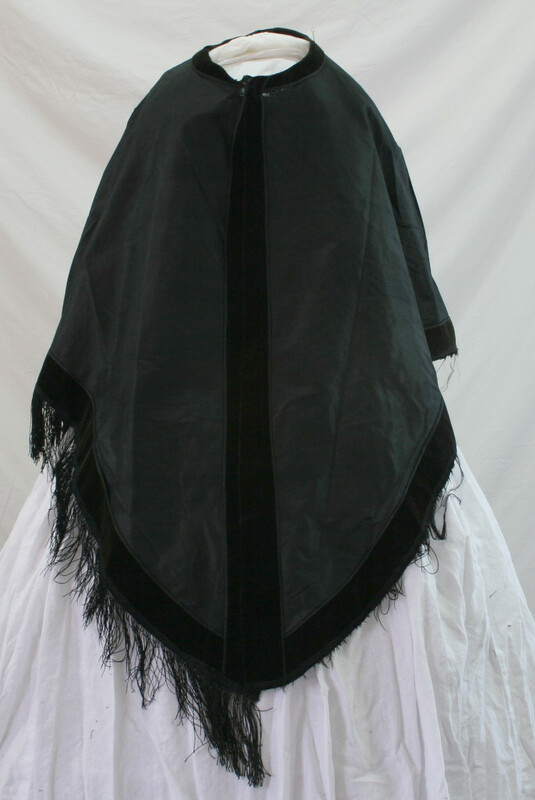 And it’s not even an era I “do”. It’s just so darn pretty. 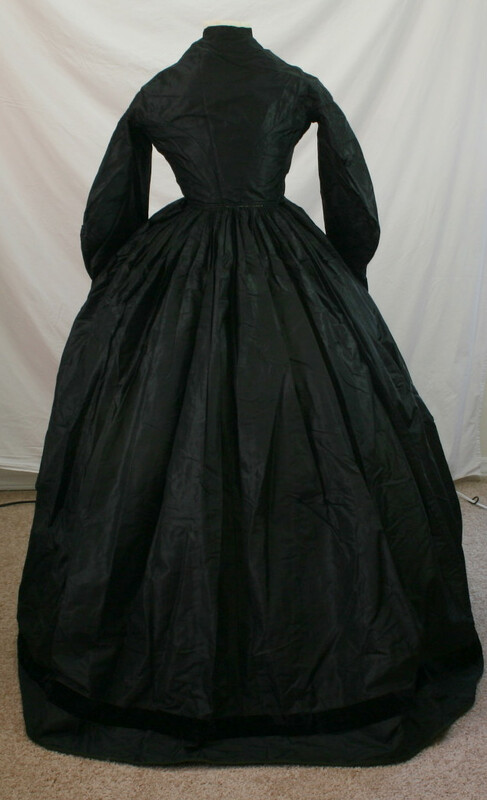 I feel it belongs in the first season of Downton, at a garden party. 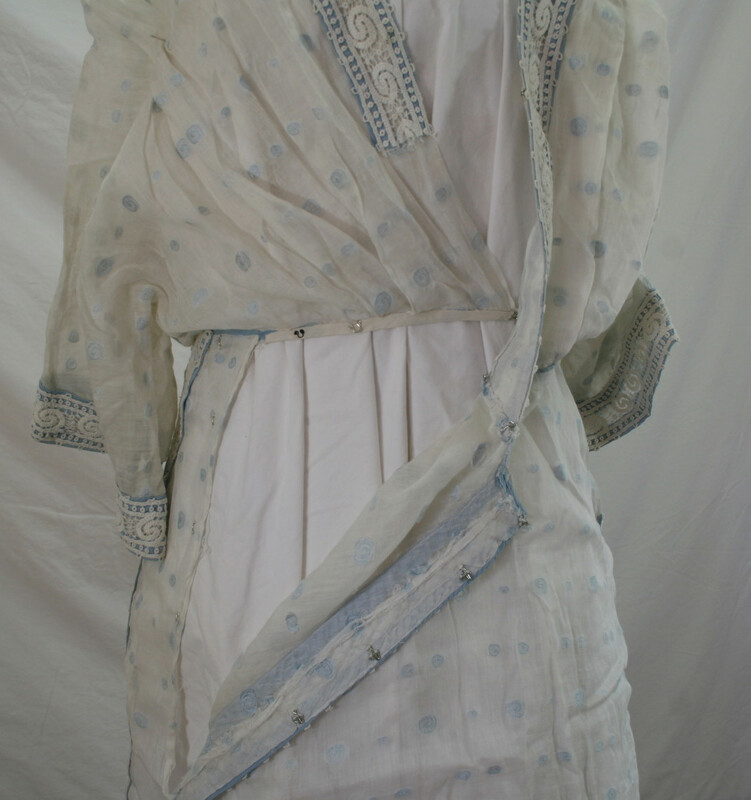 The dress is made of a very sheer, lightweight white cotton with light blue polka dots! 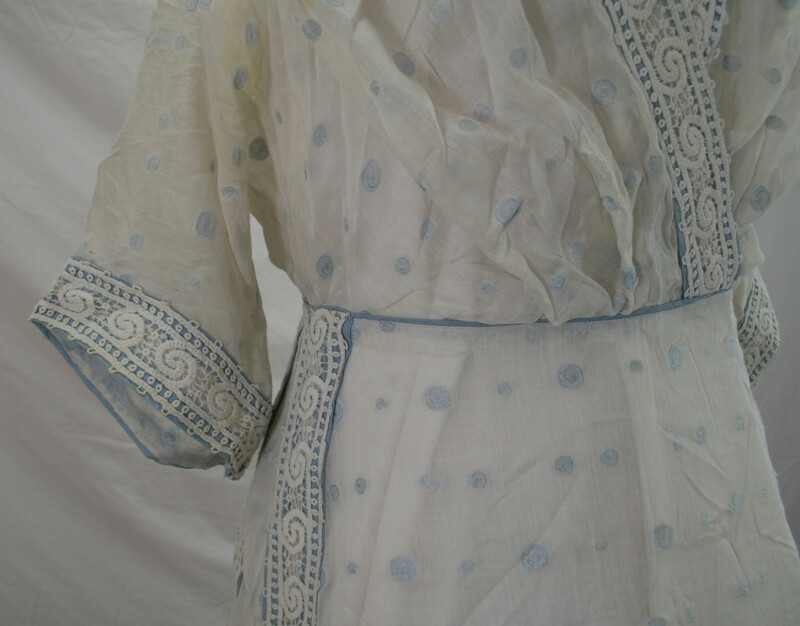 The dots are woven into the fabric. 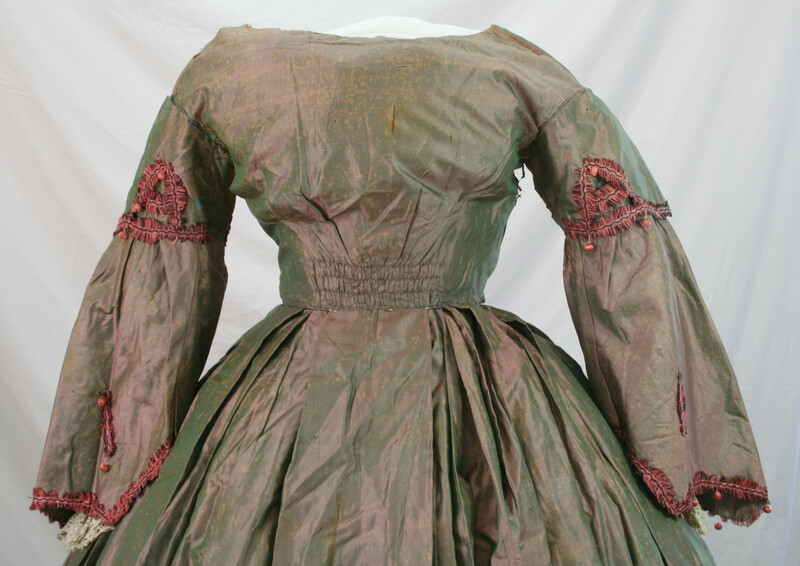 There are two trims- a blue cotton bias, and a lace trim. 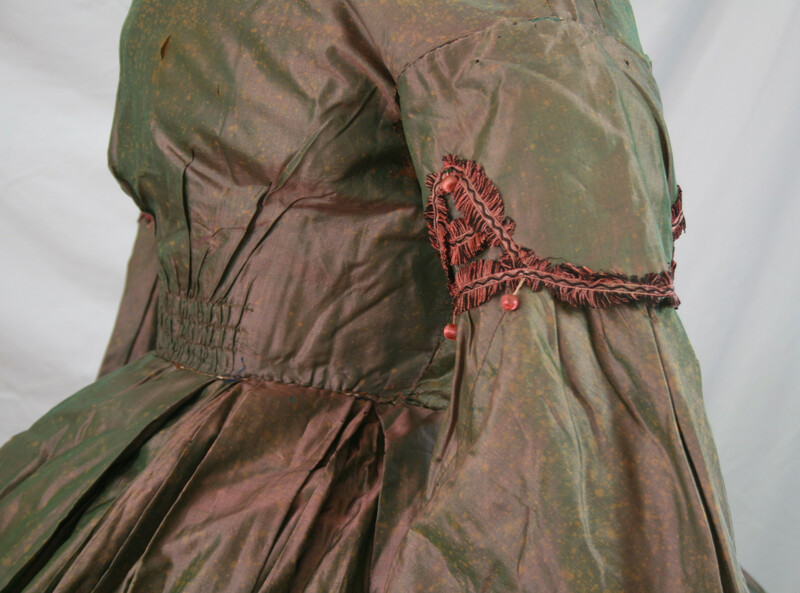 The dress is machine sewn, with much of the finishing work done by hand. 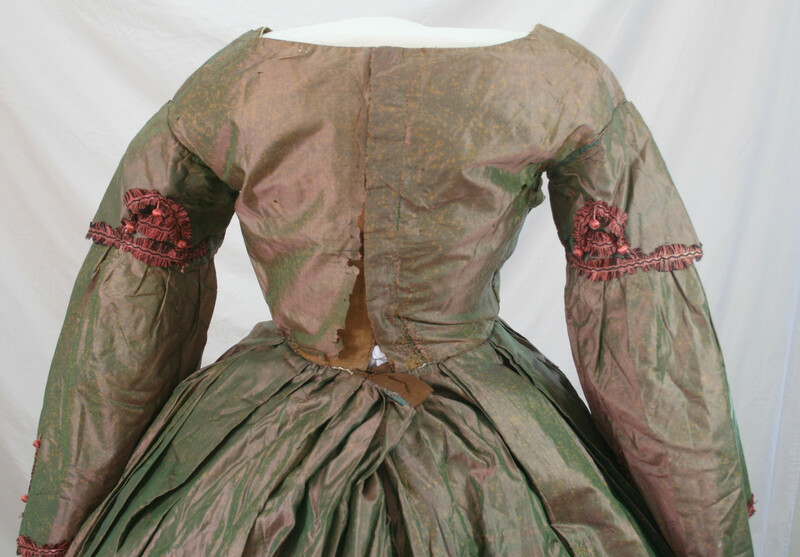 The bodice is a wrap style, cut of two pieces (a right and a left bodice), with kimono sleeves. 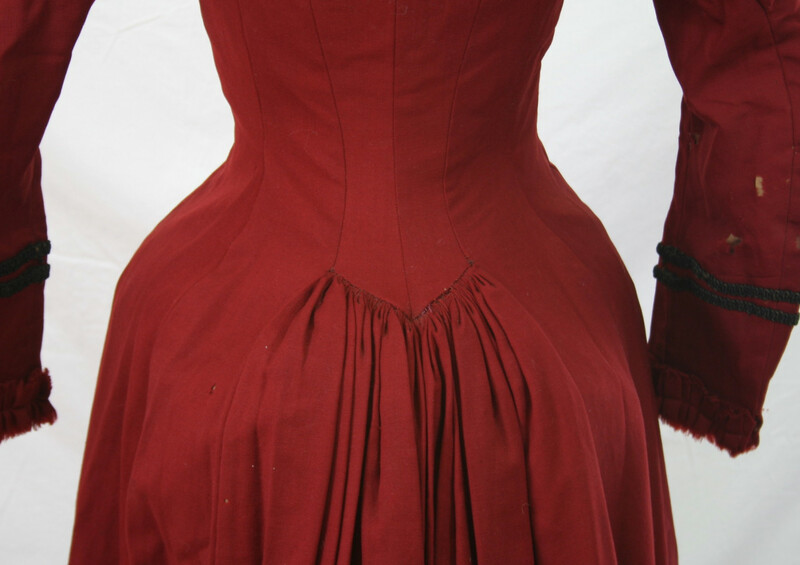 The fitting to the bodice comes from large pleats tacked and the shoulder area. 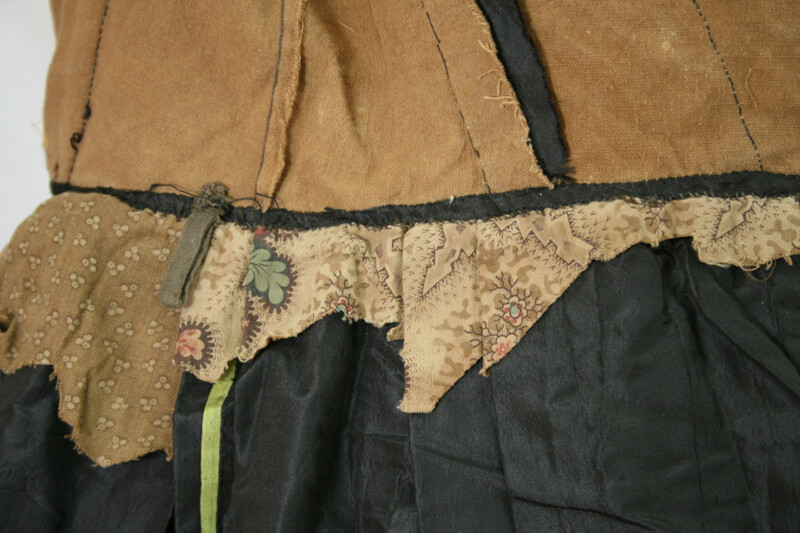 The front of the wrap bodice is tacked together and stitched to the bodice. 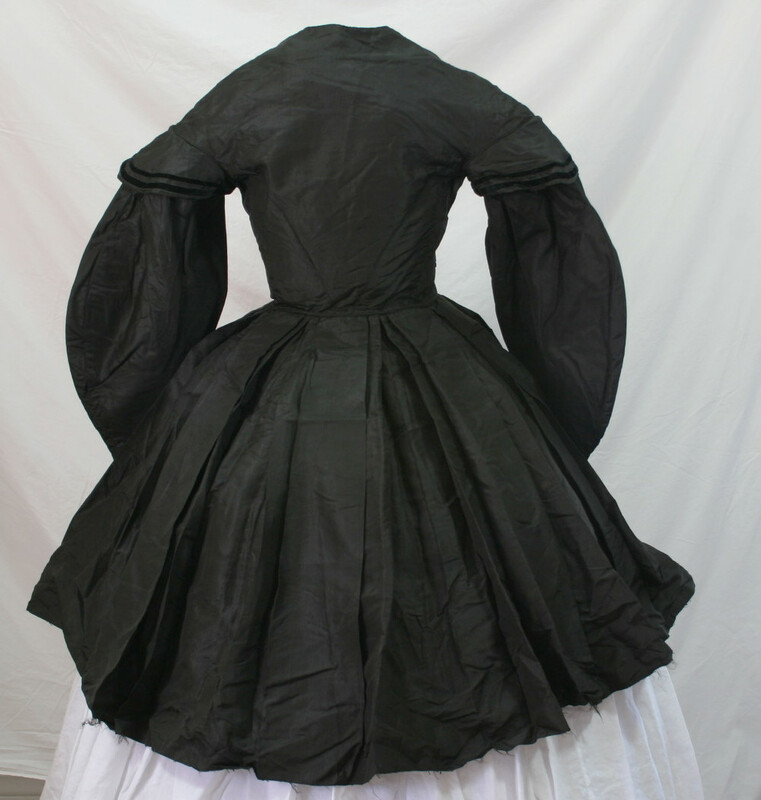 The dress opens at the side and back. 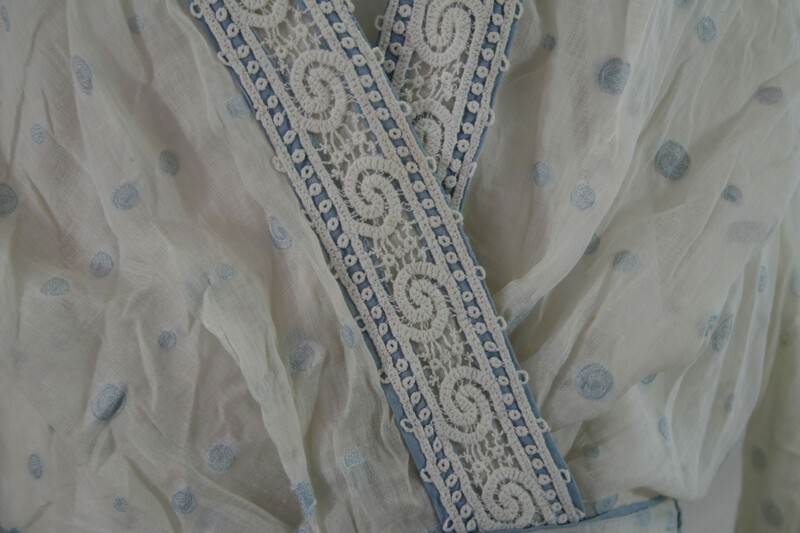 The lace trim is applied over two rows of the blue cotton bias. 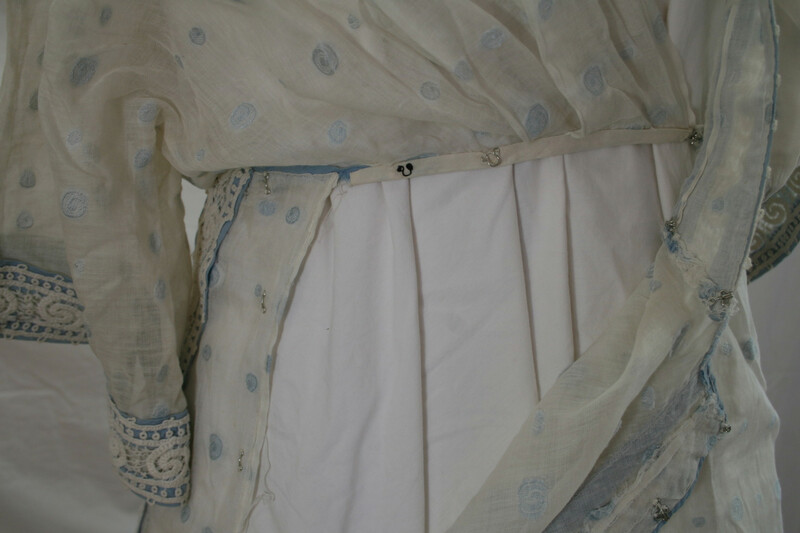 The blue cotton bias is used alone at the waist. 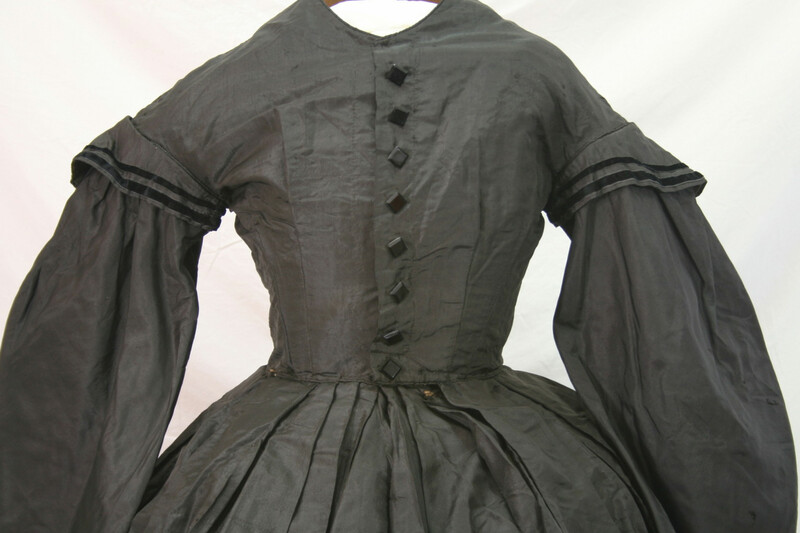 There is slight gathering of the bodice at the waist. 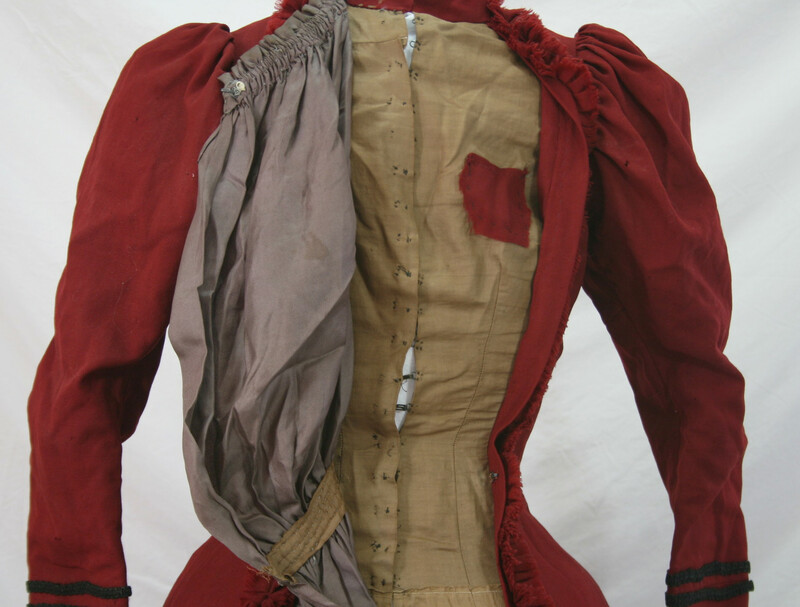 The dress opens at the side and back with a series of hooks and eyes. 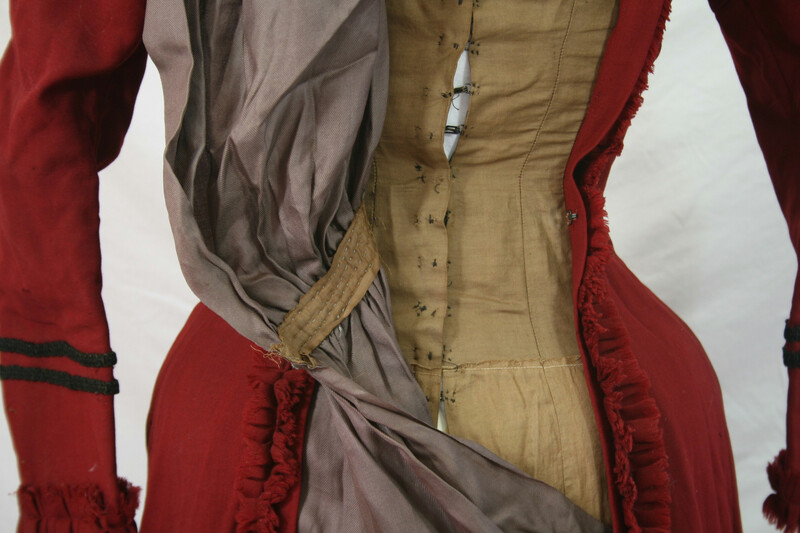 The bodice halves lap over each other and hook where the meet, and the remainder of the bodice closes along the waist. 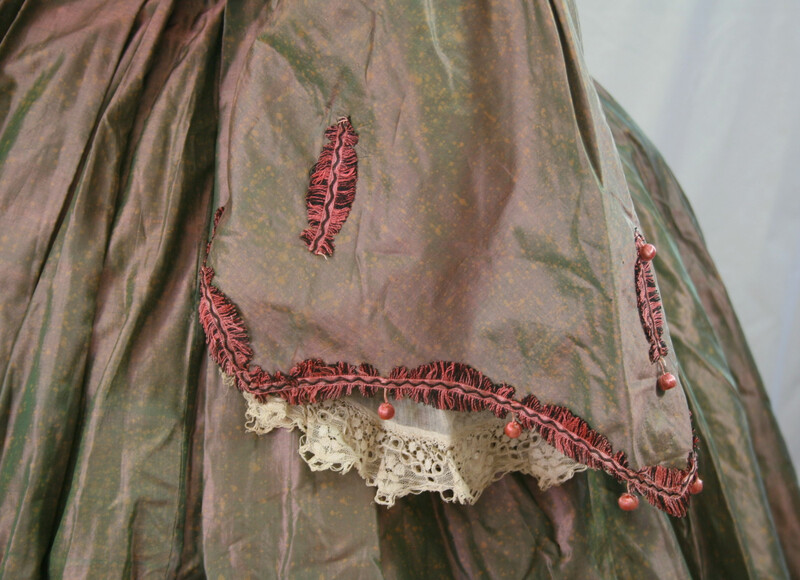 The opening is the skirt is perfectly hidden under one of the rows of trim. 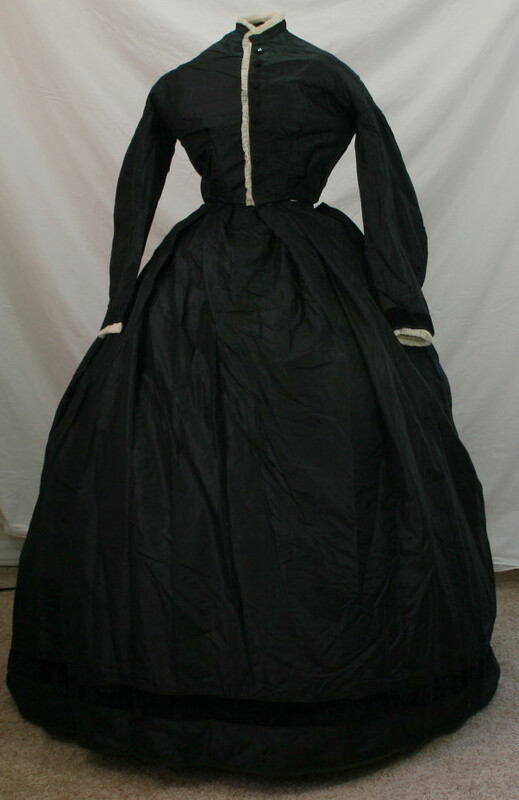 The dress has a 29″ waist. So pretty! 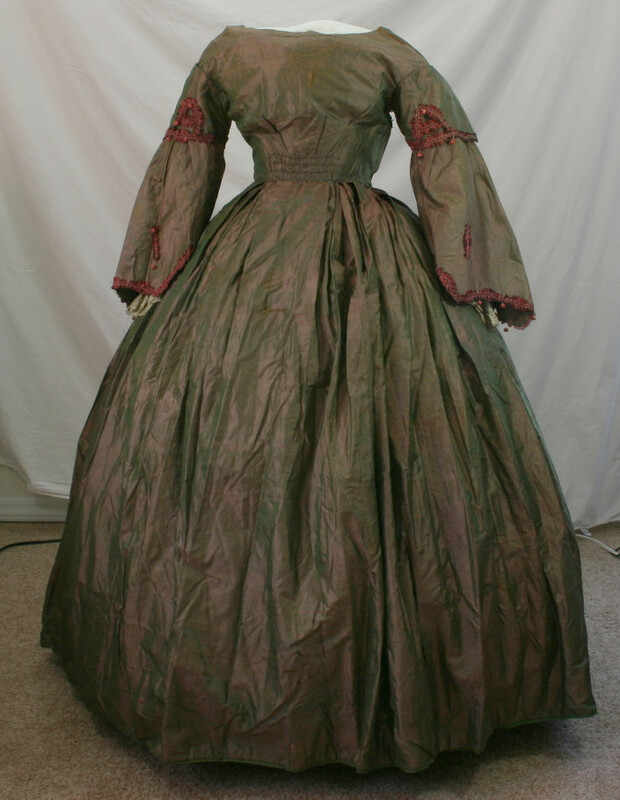 It makes me want to do this era! 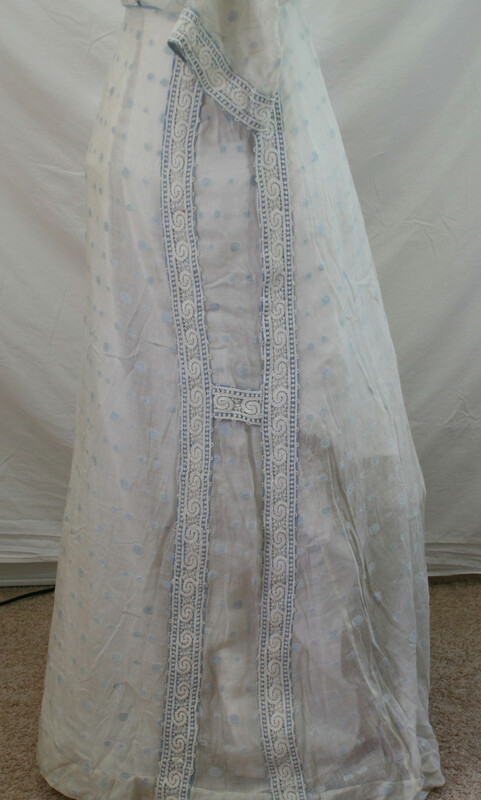 Today’s garment is easily the best example of whitework I own. 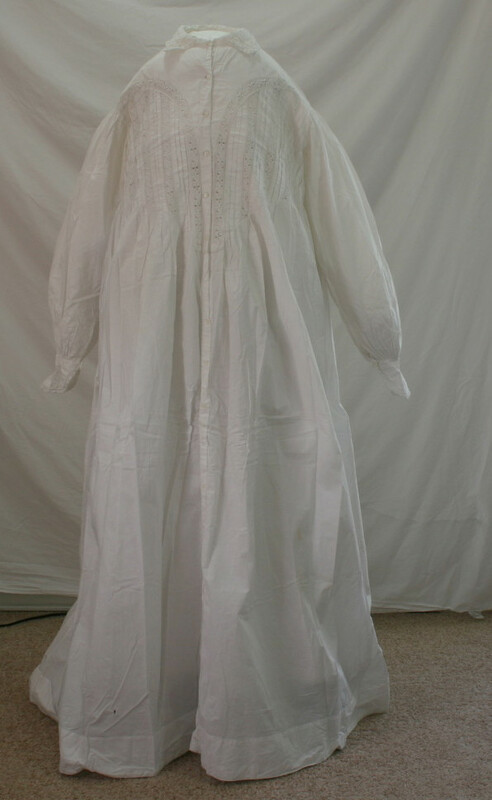 It’s a beautiful white cotton wrapper/ robe de cambre, dating from the 1850s. 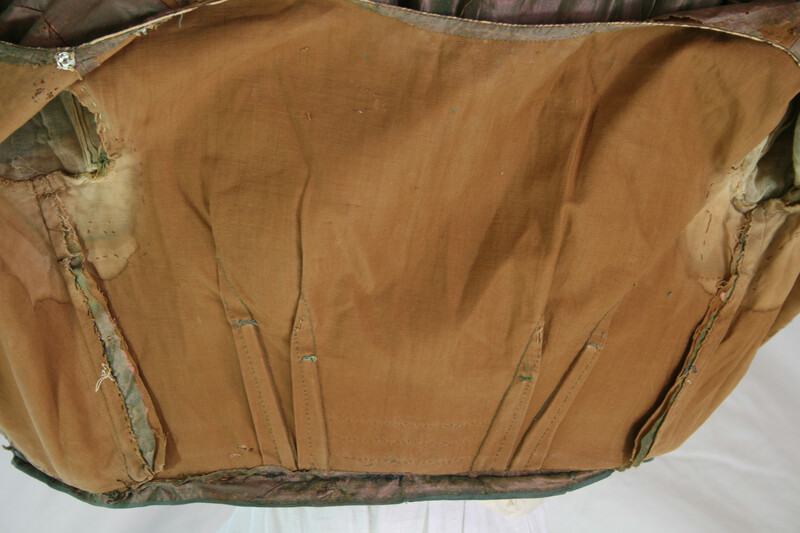 The wrapper closes with buttons down the center front. There are 17 total (technically there are now only 15), but only the top 6 are functional. 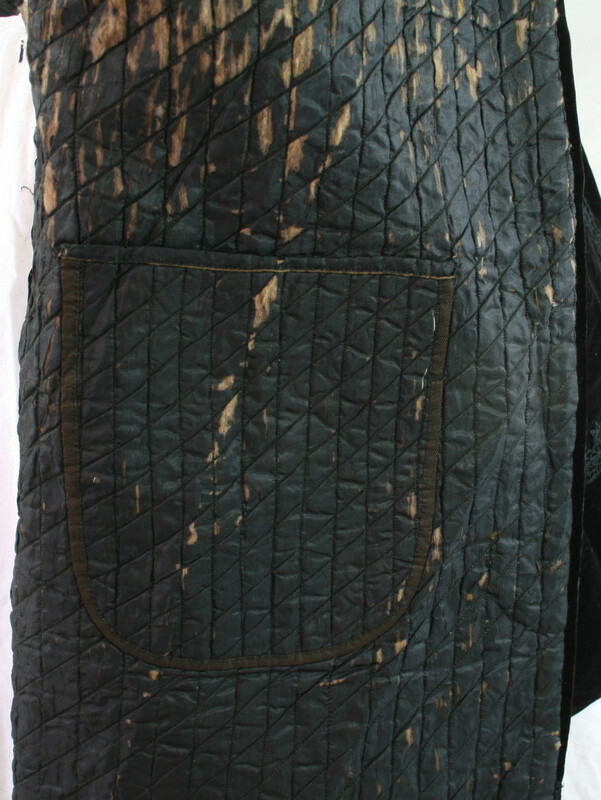 Below the 6th button the front is sewn shut, and the buttons are decorative. 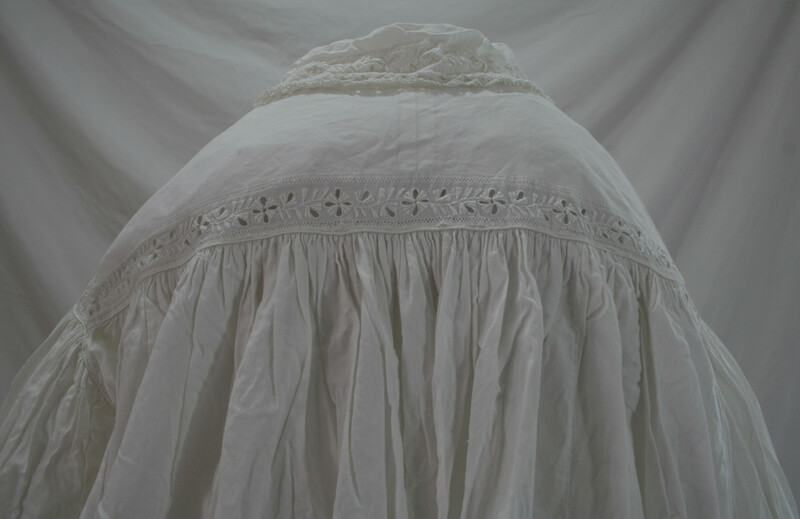 The garment is trimmed with tucks and white-work insertion. 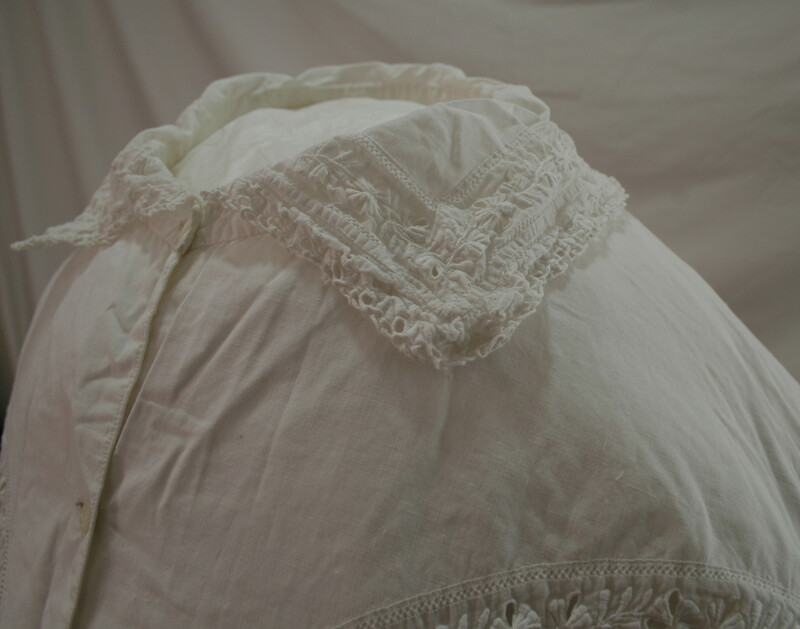 The armsyce and the edge of the yoke are finished with piping. 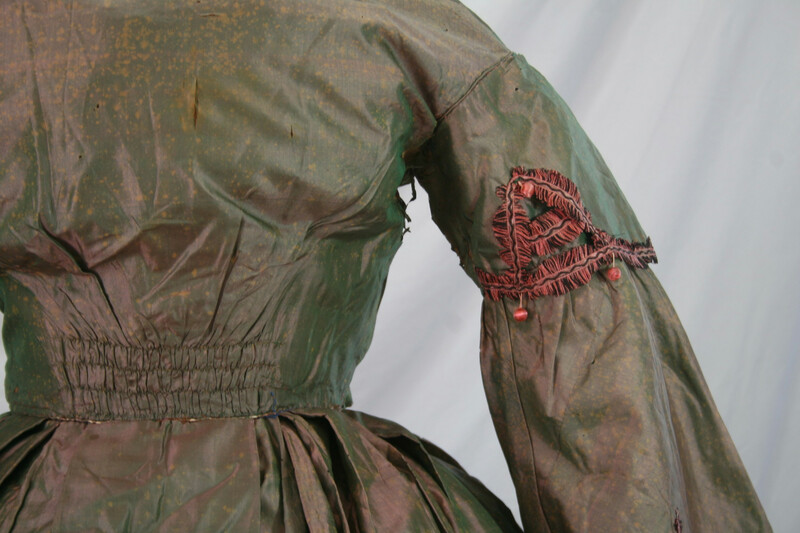 The garment is entirely stitched in one of the most beautiful, even, tight, back-stitches I have ever seen. 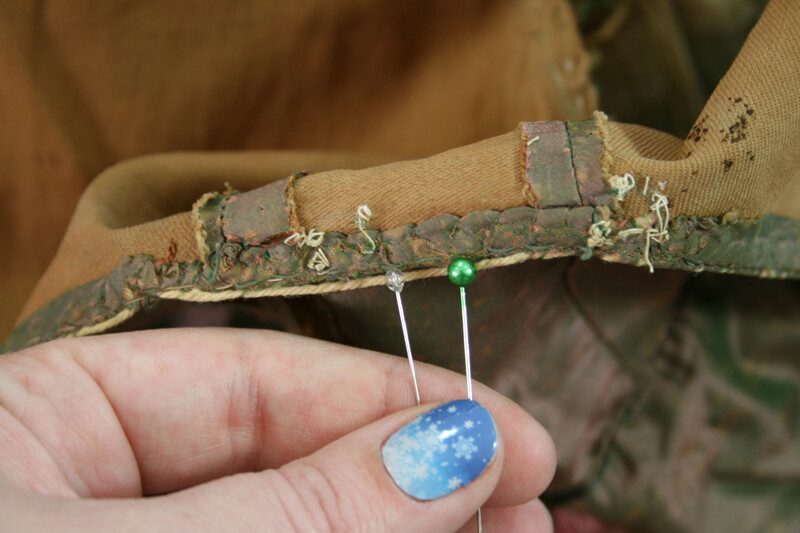 There are 24 stitches per inch the seams, and the insertion is sewn in with double-seams. 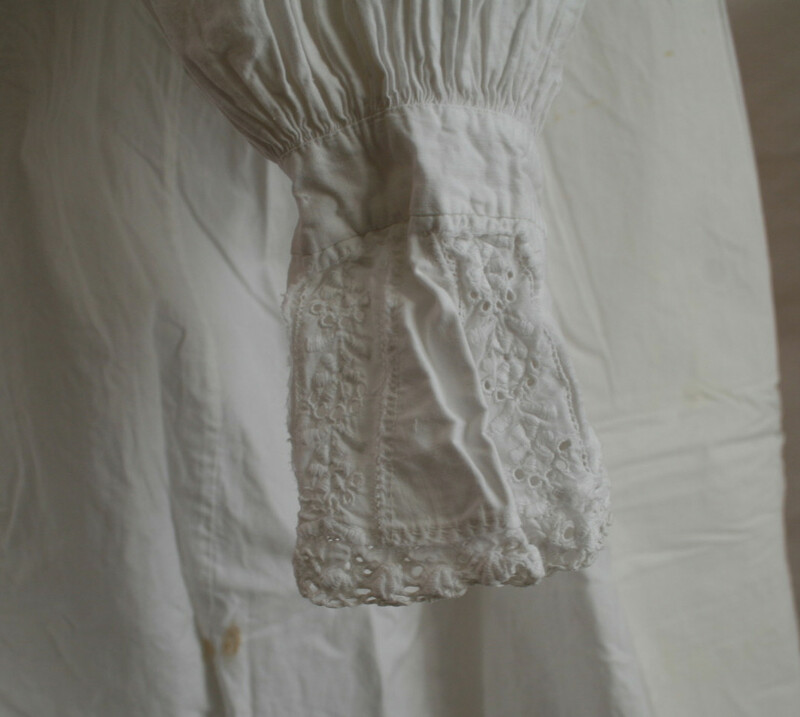 I regularly re-check that it is indeed hand-sewn, and not machine, it is so perfect and even. 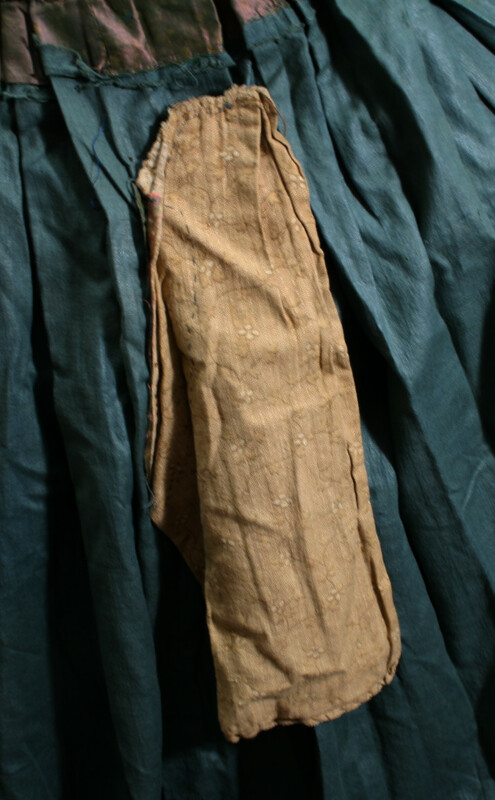 There are two gores in each side seam to give it it’s fullness. 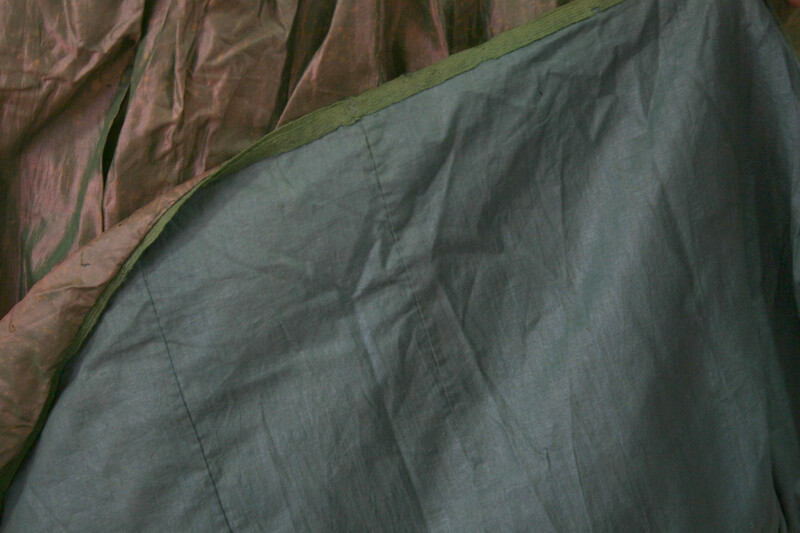 The raw edges on the inside of the garment are overcast. 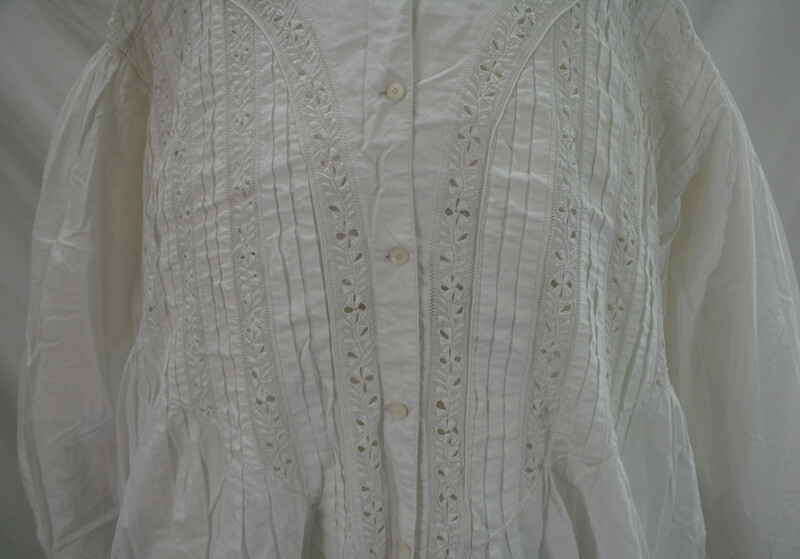 The collar is finished with a bias band on both the inside and outside. 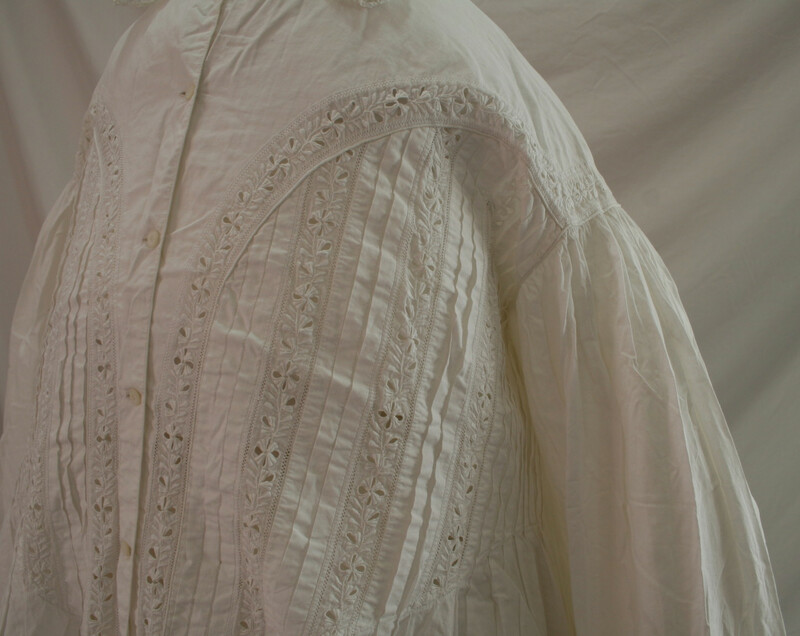 The sleeves are full “bishop” sleeves and have a white-work cuff. 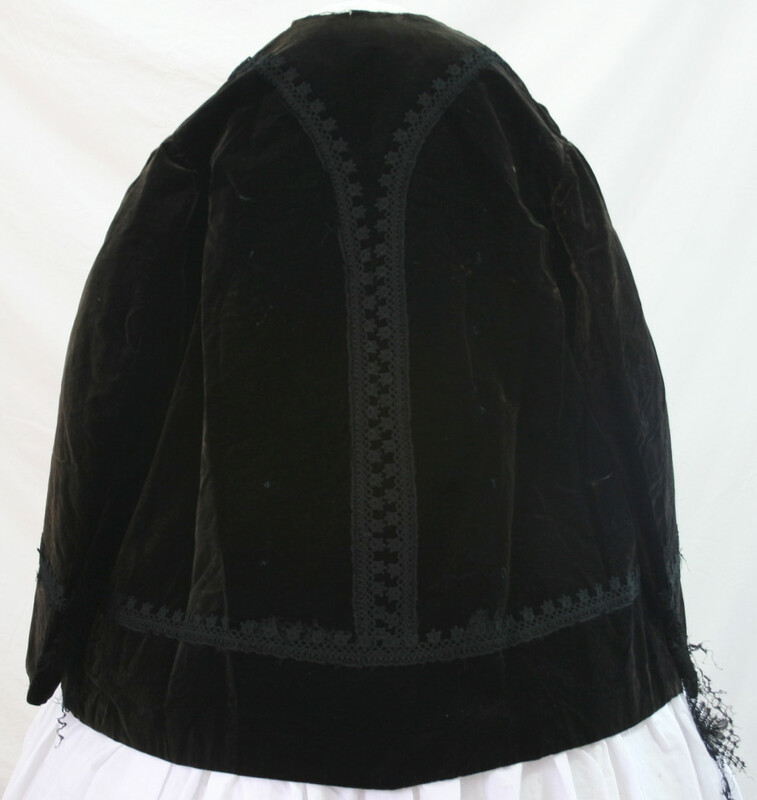 The back of the garment’s only trim is the yoke. 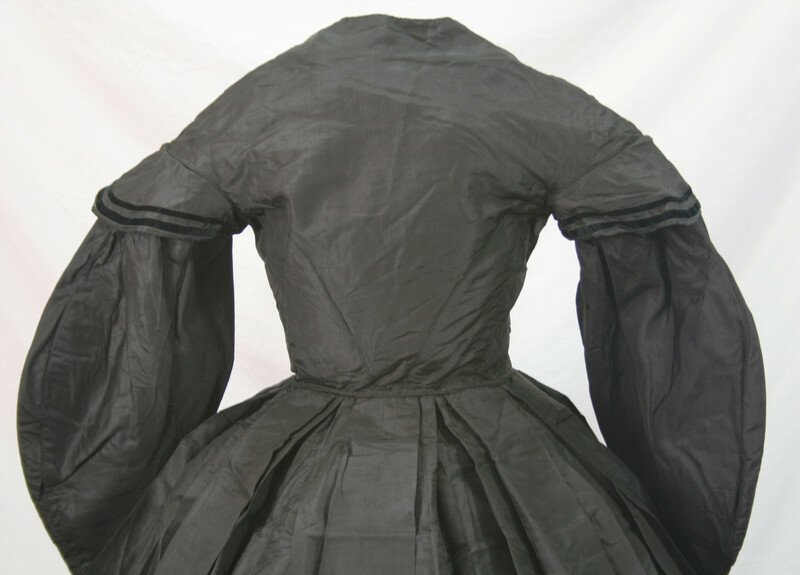 The back’s fullness is controlled with gathers, whereas the front is controlled with the pleated panel. 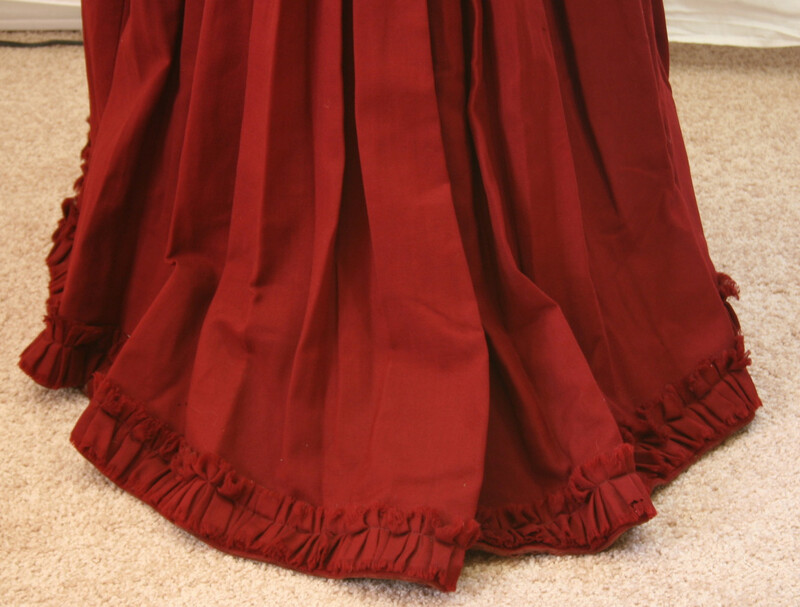 Even the hem is stitched with just the finest little stitches you have ever seen! If I ever develop a great amount of patience, I would like to reproduce this one day! 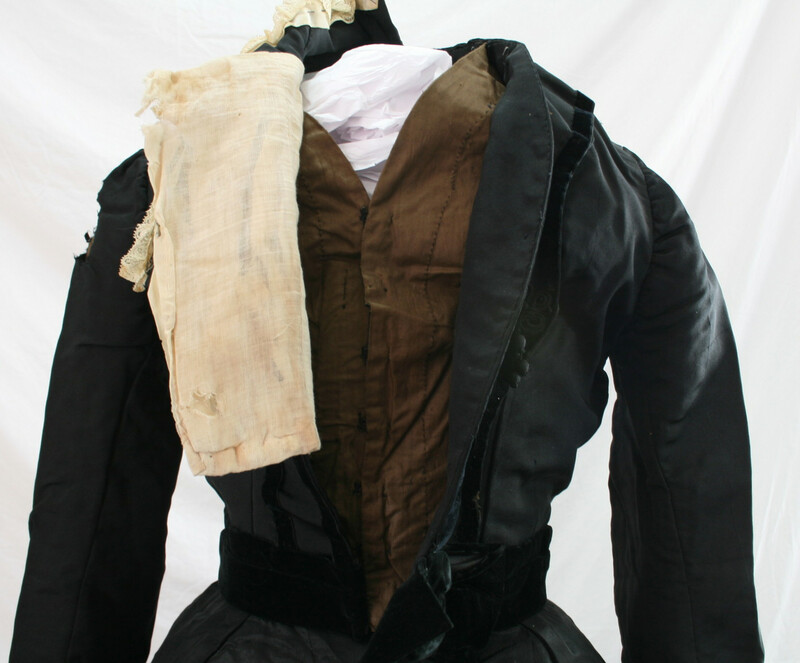 Today’s garment is a much lighter type of outwear than the coat we looked at last. 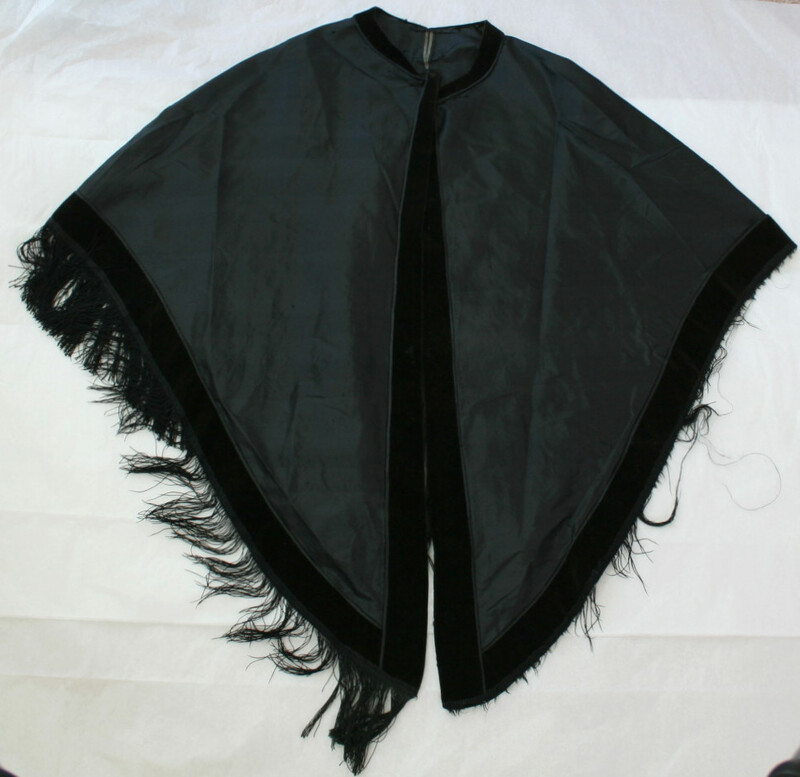 This silk wrap is made of one layer of unlined silk, and trimmed with silk velvet and fringe. About half the fringe is now missing. 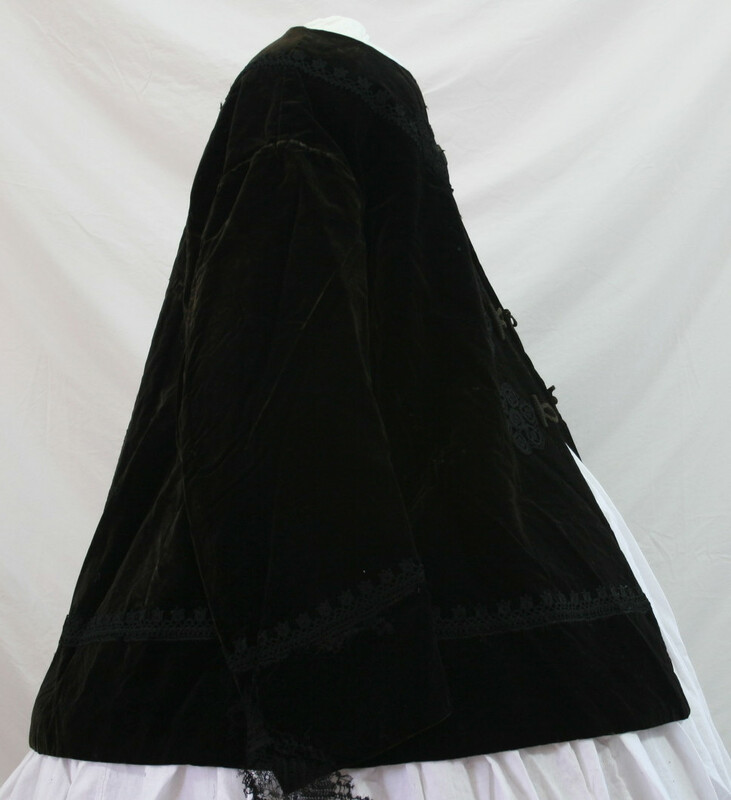 The front is much longer than the back, and the garment closes with a single hook and eye and the collar. 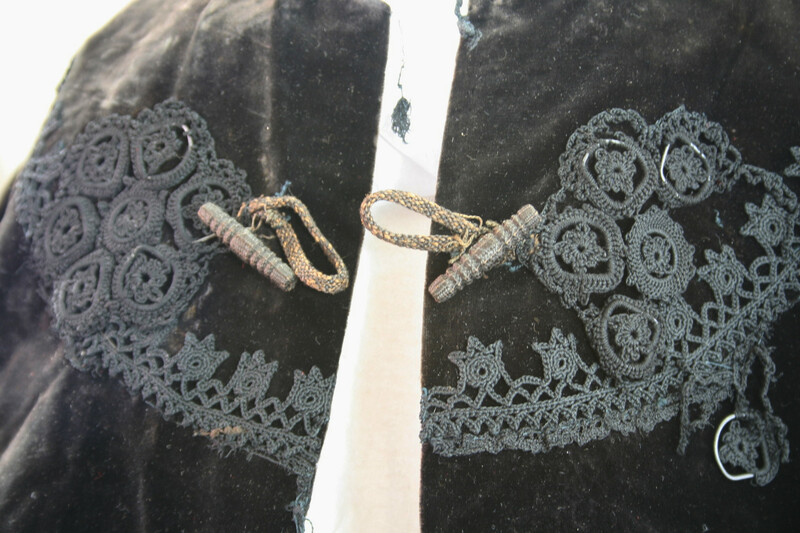 The black silk velvet trim is made of cut fabric, not ribbon. 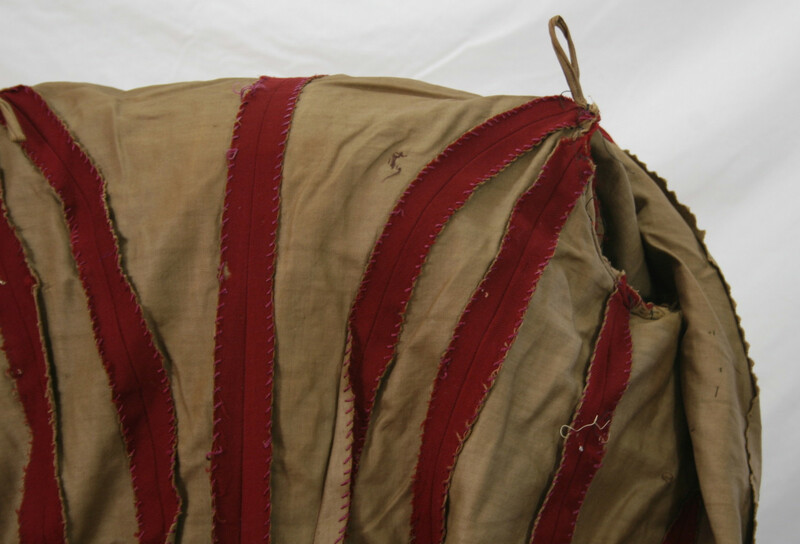 The fashion edge is bound with the silk fabric. 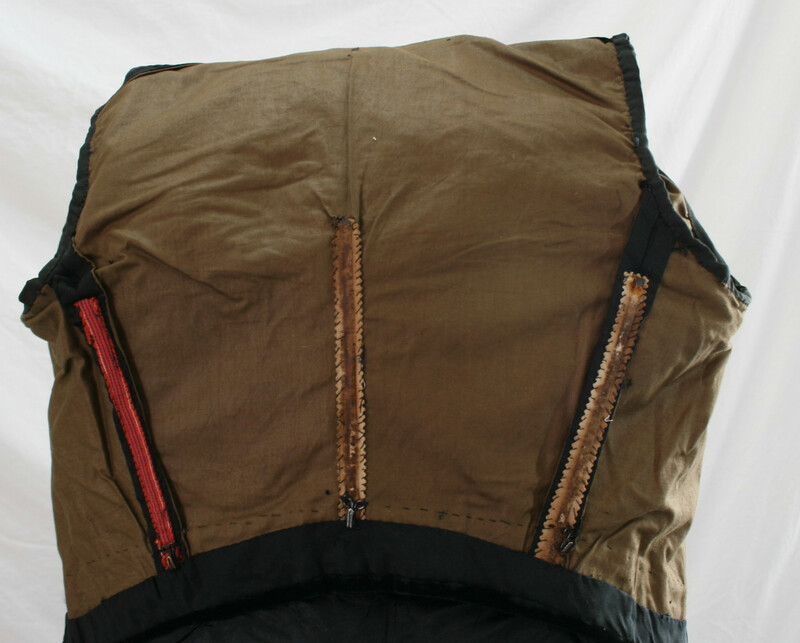 On the center front, the raw edge of both fashion fabric and trim and stitched together, and the trim is top-stitched to form the edge. 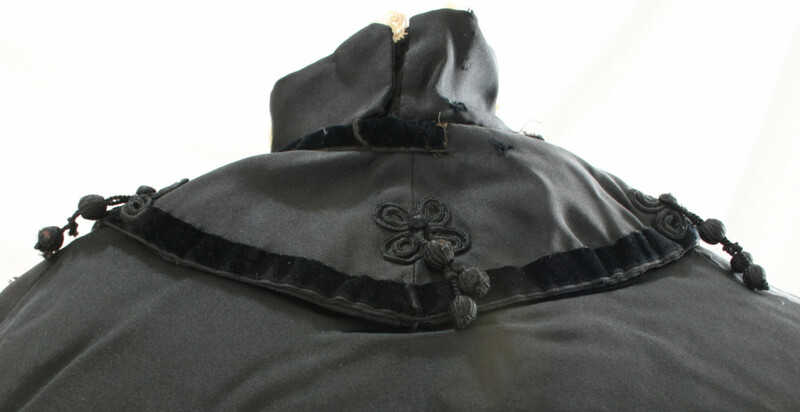 On the neck edge, the raw edge of the velvet is encased in a bias bind. 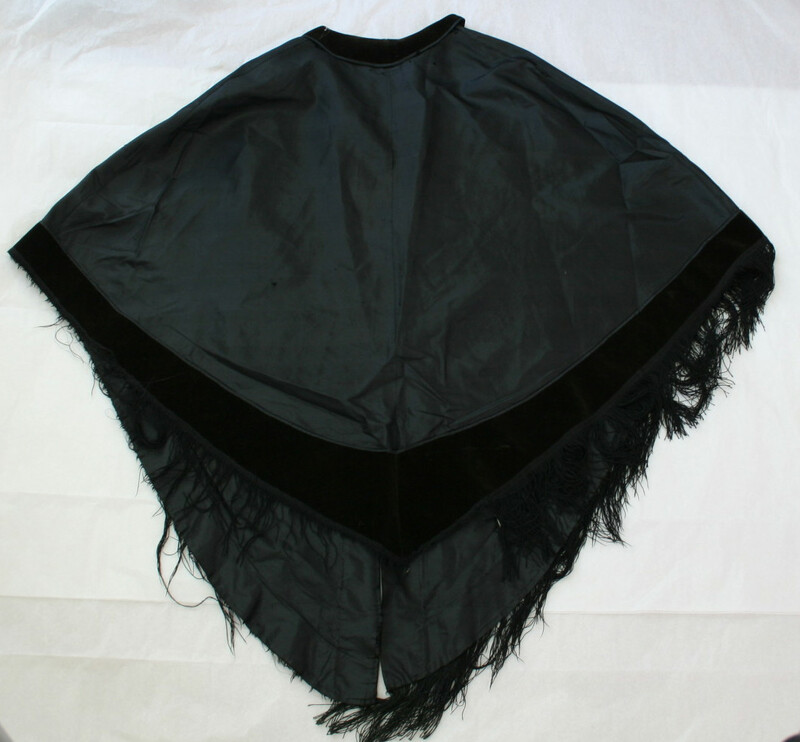 On the bottom fringe edge the velvet is left raw under the fringe. 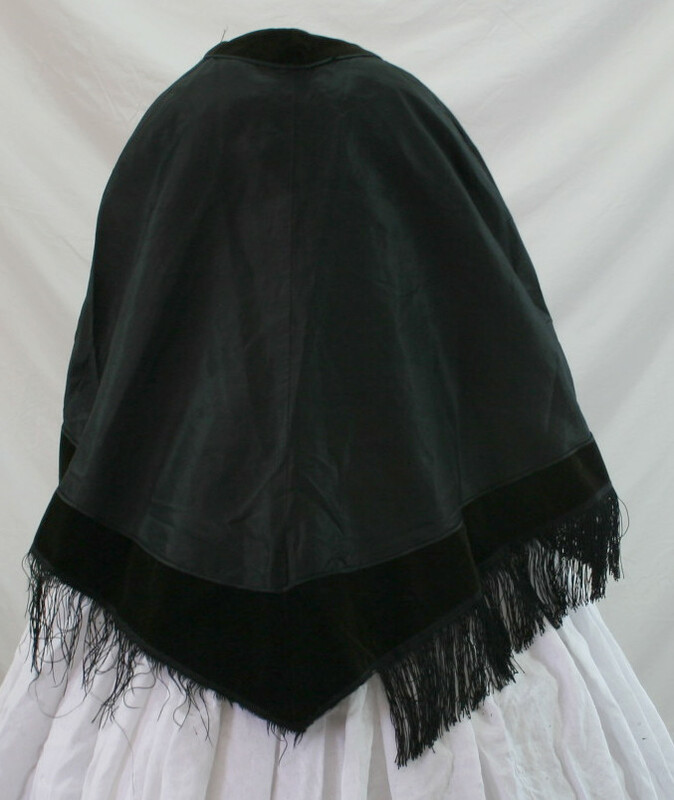 All and all, it’s a very neat piece of because of how the edges are finished. 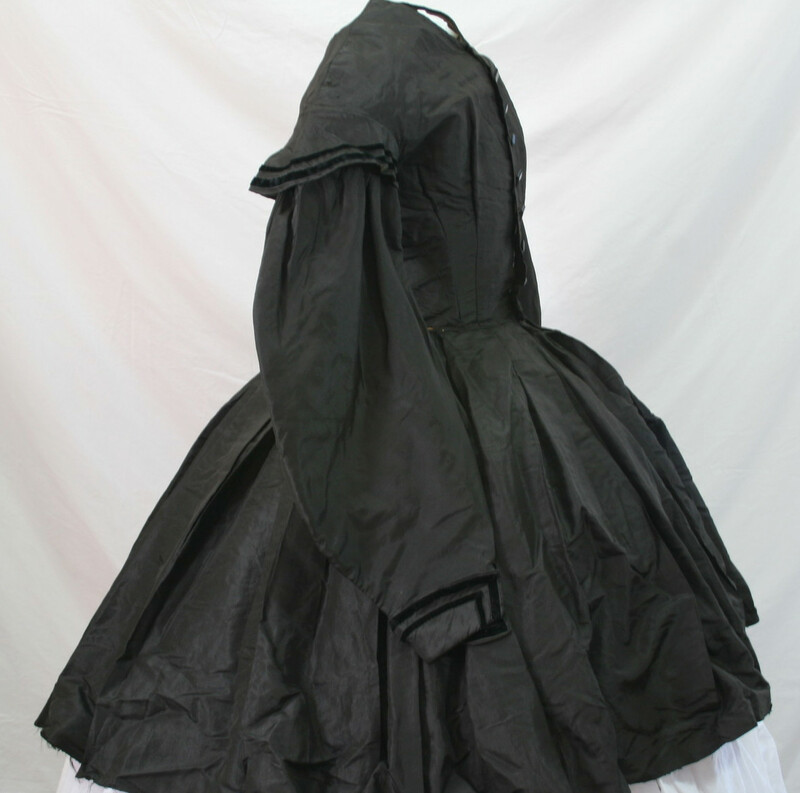 The garment is made of three pieces total, 1 back piece and the two fronts. 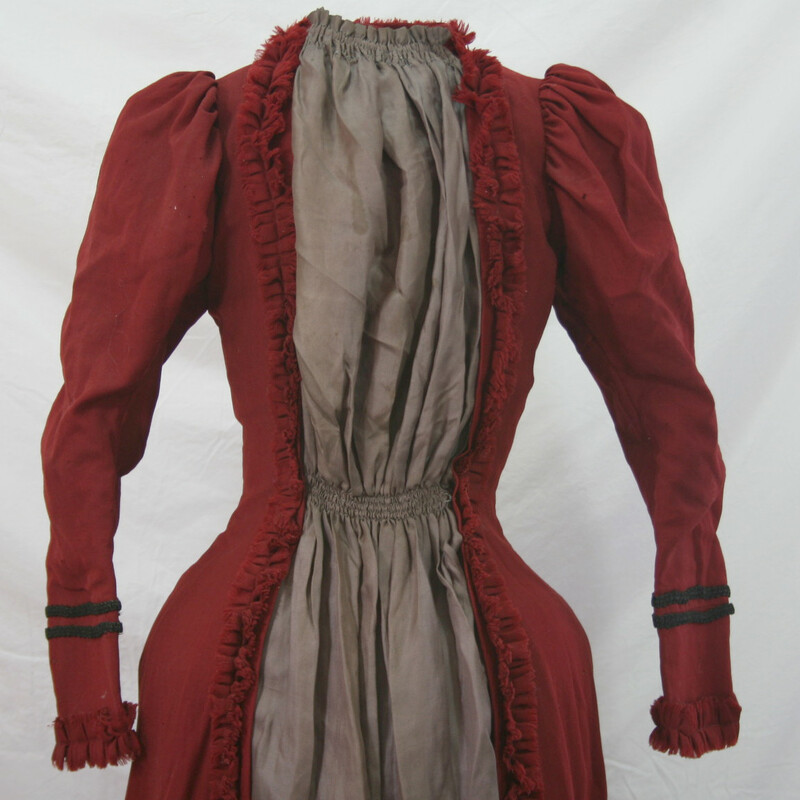 A fairly simple garment, but very striking! 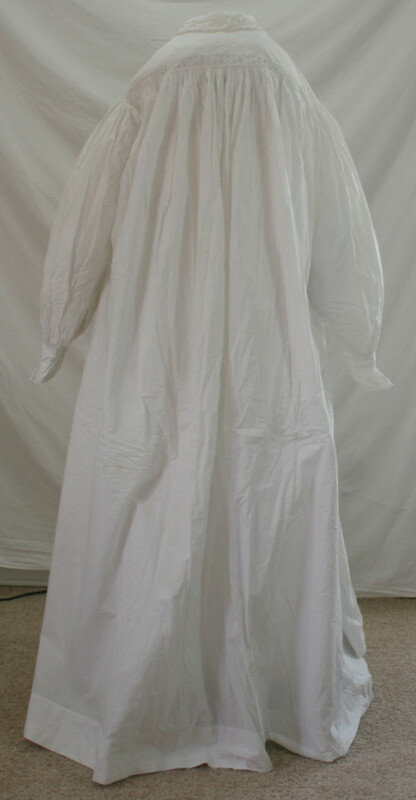 Today’s garment is perfect for the weather we are having! 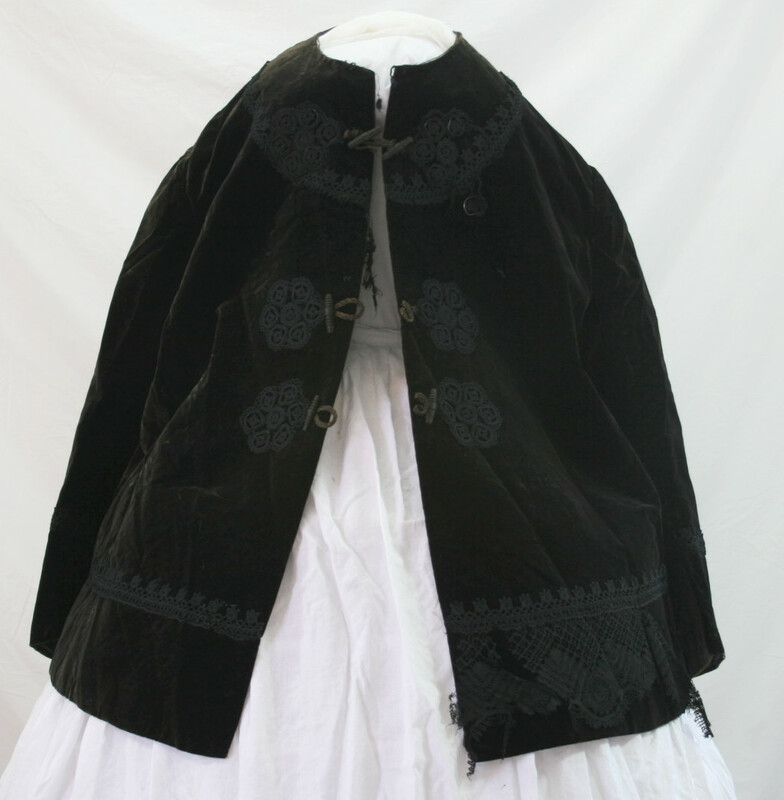 It’s a black velvet short coat, fully lined with a quilted lining. Warm and toasty! 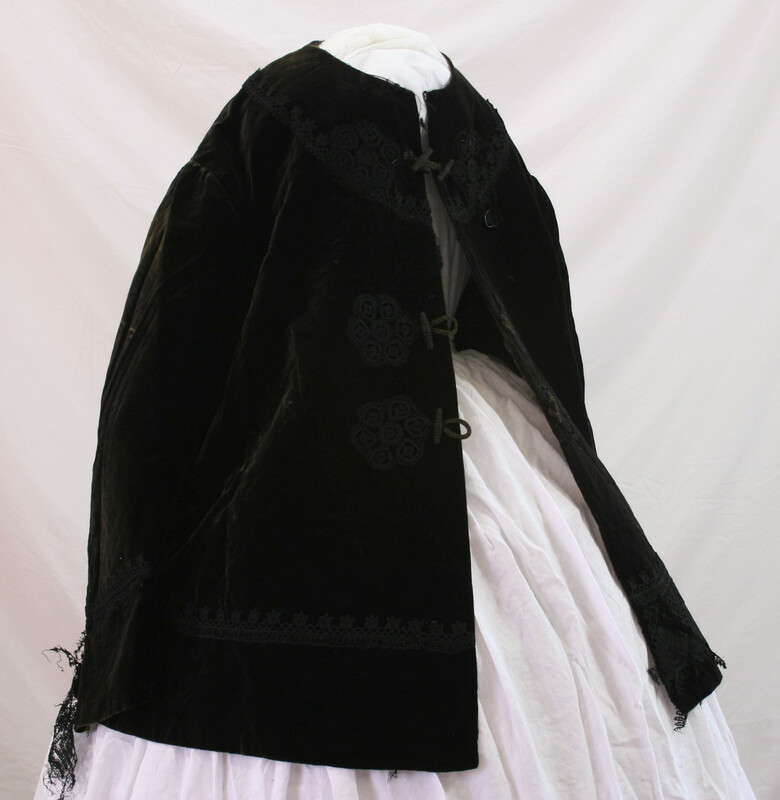 The coat closes with with three loop and ball closures, and the coat is heavily trimmed.There was lace that went around the bottom of the coat, which is largely gone now. 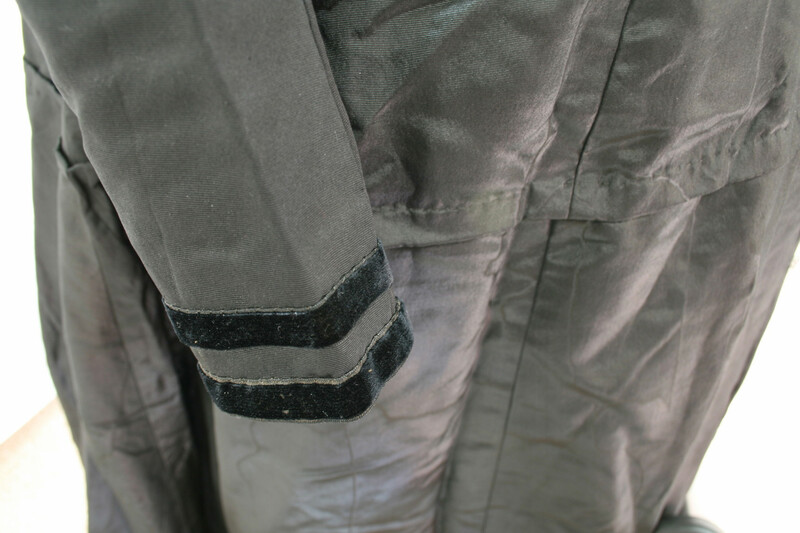 There is still plenty of other trim that remains on this coat though! 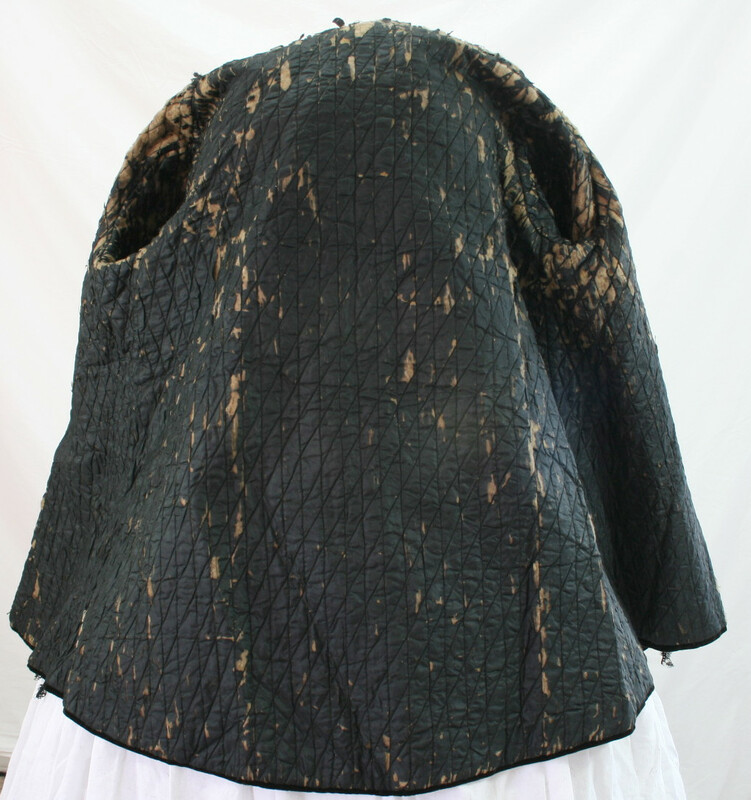 The back is cut in one piece, and there is no shaping to the coat beyond the seams. 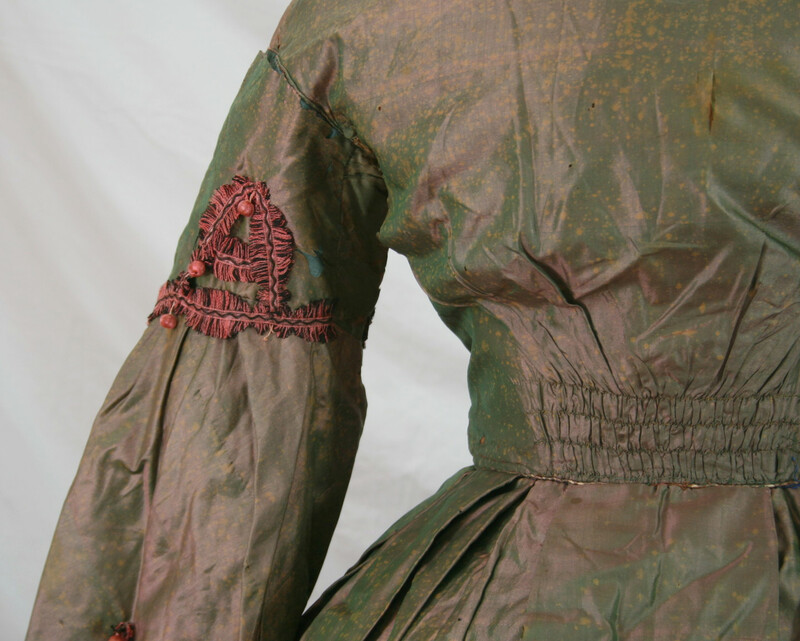 The sleeves also had lace matching the bottom of the coat, but is largely missing now. 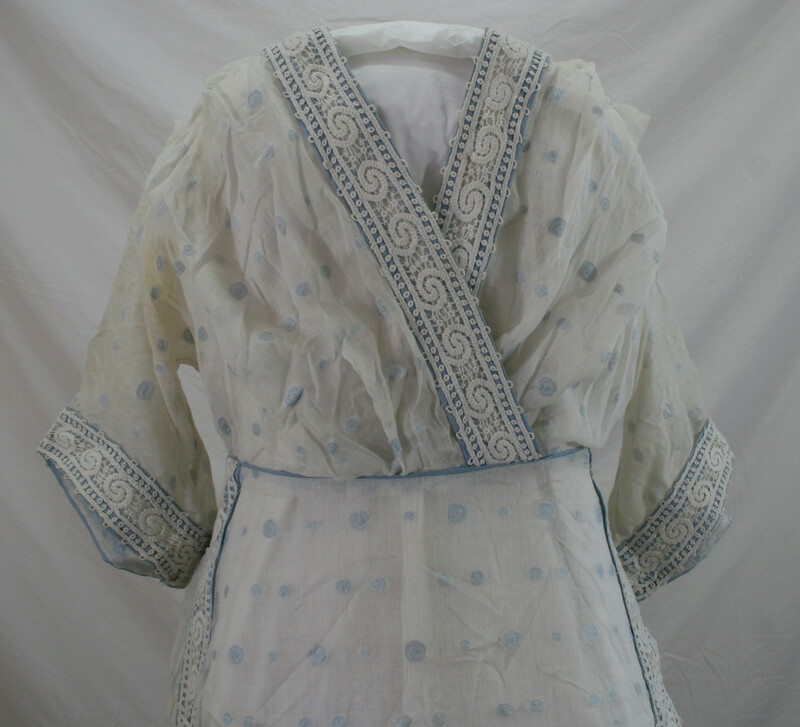 The neck edge is finished with bias piping of the lining silk. 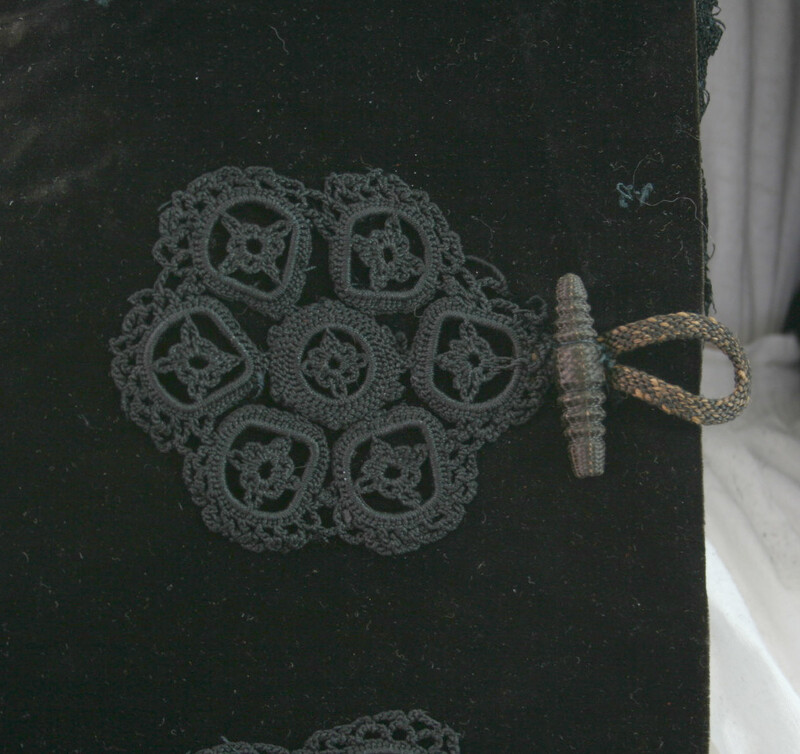 Detail of the trim at the front closure- the loops are worked over metal rings. 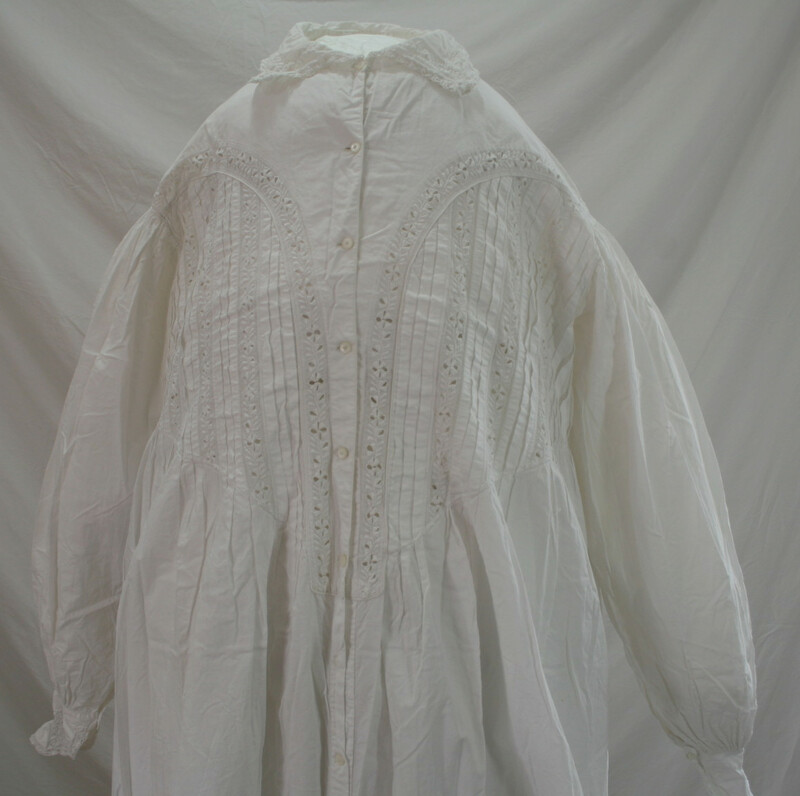 The silk lining is interfaced with wool batting, and machine quilted. 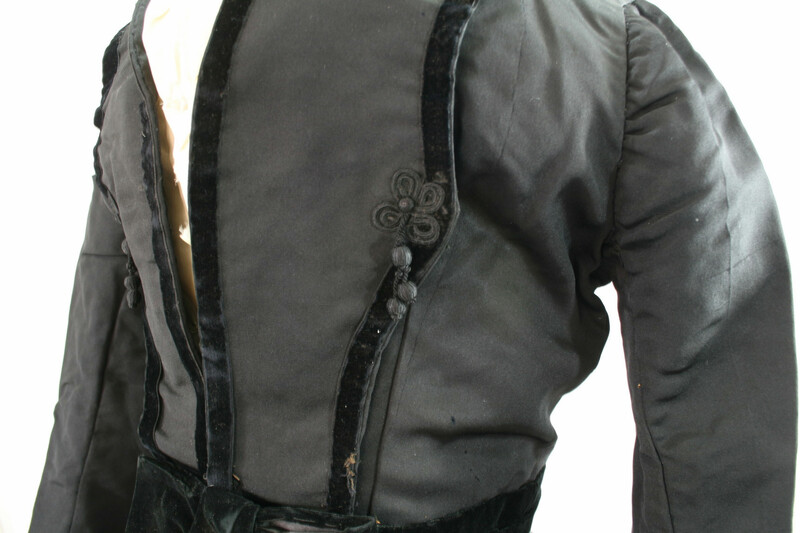 And look, a pocket inside the front! 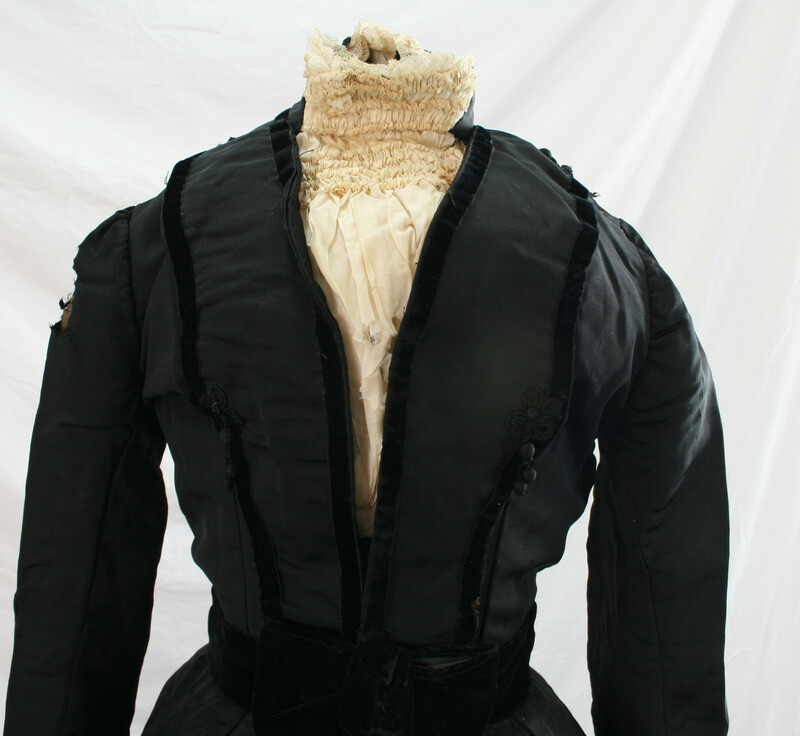 The entire coat is lined, including the sleeves. 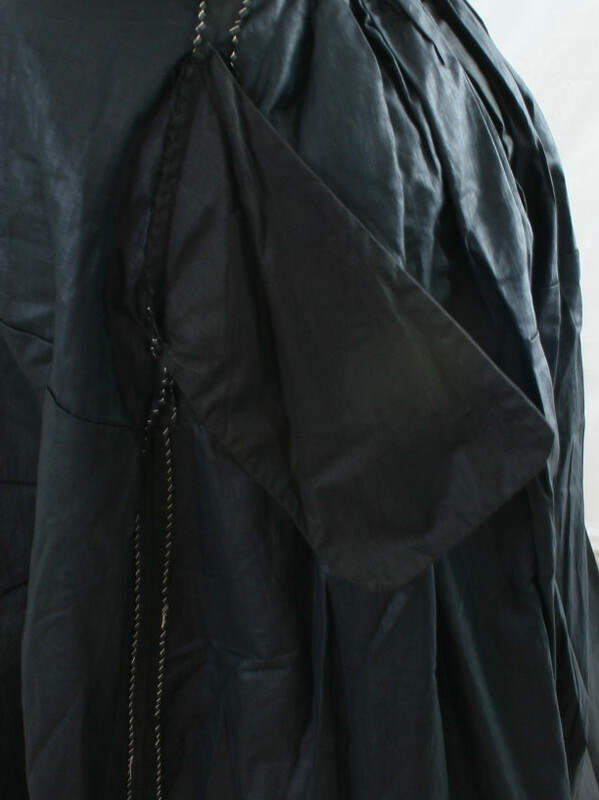 The lining and the coat are constructed separately with their raw seams concealed in the interior of the coat.